My sweet, beautiful grandma left this earth last week and went to be with the Lord. While I am so happy that she is free from pain and is rejoicing with the angels, it’s hard to let her go. She was an amazing woman of God and I’m honored to have called her mine. Her passing has caused me to reflect on the impact that she has had on my life, so today I’m sharing a few lessons that she has left me that I hope to carry on as a part of her legacy. My grandma was what you would call a prayer warrior. She diligently prayed for everyone and everything on a daily basis. In fact, she used to go on prayer walks every morning so she could talk with the Lord. I truly believe that one of her main callings in life was prayer. The day after she passed, I went through and read all of the letters that I had received from her which were suddenly more precious to me than anything else in the world. I am extremely grateful that she took the time to draw me pictures and send me encouraging notes. There is something so incredibly special and personal about a handwritten letter that can never be found through a text or e-mail. As I mentioned, my grandma loved to go on walks. She also loved to swim, camp, hike, float, fish, garden and anything else that involved being outdoors. I truly believe I inherited this appreciation from her and I hope to one day pass it on my children. My grandma was the most faithful woman you would ever meet. She loved Jesus and everyone knew it. Even during hard times, her faith never wavered. I don’t think I realized just how much she taught me through her words and actions until she was gone. I’m eternally grateful for her faithfulness that has impacted generations and I pray that I will one day have the same impact. I wanted to write this as a reflection of the legacy that my grandma has left me, but I hope that others will be inspired by her life through my words. I will leave you with a poem that she wrote which pretty much sums up the way she lived her life. What a wonderful legacy your grandmother left for you. I hope I can leave a legacy such as this for my children and grandchildren! I grieve with you for your loss but also rejoice with you for her gain!! Is it okay if I share her poem? Is it copyrighted? I hope so because it is beautiful! Yes you can share the poem. I don't believe it is copyrighted, but we should look into it. Thank you for your kind comment! I am so sorry for your loss. Your grandmother sounds like a wonderful woman. You are right, I will carry her memory with me in my heart! Sorry to hear of your grandmas passing. Grandparents are surely special people. I love being a Grammy. Hope my grandchildren feel the same way about me someday. What a beautiful legacy, Missy! She sounds like a delightful, godly lady. How special that you got to call her Grandma. I'm so sorry that you had to say good-bye though. I know that is hard! My 91 yr. old grandpa passed away last fall and while his wife, my grandma, is still living, it has made me realize in a new way how special and short the time we have left with her is. I'm just so grateful for the gift and promise of being reunited in Heaven some day! I still have three living grandparents and I am trying to soak up every memory I can! Thank you for your kind comment. What a beautiful post for an extraordinary woman. Thank you for sharing it with us. The poem is very touching. I lost a grandmother 14 years ago whom I loved very much. I will always miss her but I'm grateful for the legacy of love she left me. What a beautiful legacy and picture. Thanks for sharing your heart. That was beautiful! I've not had the pleasure of grandparents. But, if I did, she is who I would've loved to of called my grandma. You were blessed to have her for your own. Make sure you keep those letters for your children to read someday. Im a Christian children's book author and I love pen and paper. I too, love the outdoors. And find myself out there when I should be in the house cleaning the bathroom or cooking dinner. Hahaha. God Bless Missy! And I enjoy your website. I am so happy that you wrote about your Grandma. My Grammy went to be with the Lord 2 years ago and let me tell you a little about her. She was a brave fighter that loved Jesus everyday and let everyone know. She was a diabetic and had dementia. I NEVER heard her complain about anything EVER! 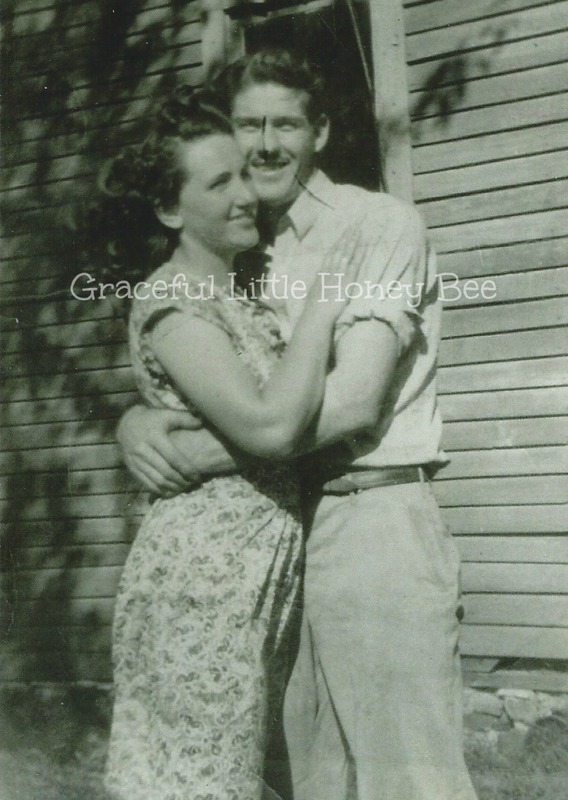 Not about the shots or the food she was limited to eat and when the dementia took pieces of her and she knew no one she did remember old hymns that she would sing small pieces of which at times brought me to tears. At the time she was to leave this earth I remember sitting quietly and singing softly with her. I can only try to be half of the woman of grace she was and want to leave a legacy that she would be proud of. Thank you for sharing your story. You grandma sounds like a wonderful woman. Thank you so much for sharing your grandmother with all of us. The prayer that she wrote I will also pray and share with my children, grandchildren and great grandchildren. reading her prayer today was a blessing from heaven.